I know this just seems ridiculous to most of us. Why would you go out looking to buy an object that is haunted? To me that is just NUTS! I think you would be looking for trouble. Also it would stand to reason you just might get more than you intended. While researching another article I stumbled across a posting on the TAPS (The Atlantic Paranormal Society) site by Al Tyas titled Buyer Beware! Collecting Haunted Object. Now I am very familiar with the slogan “Buyer beware” because slowly but surely strange things began to happen in my home. It began with the usual feeling I was not alone. Then along came the electronics going haywire. The remote control flips by itself, and the phone disconnects. Strange scratching on my outside door has occurred as well, and I did see a gray image in the corner of my bedroom. My cats stare and cry at nothing as well. Most of this was ok for me, mainly due to all the haunted homes I’ve been in. However, the two most awkward things that have happened so far are the big giant orb seen on the Infrared camera and the feeling someone is sitting on the side of the bed….those I’m still adjusting to! I collect antiques myself, but I think I will ask questions of the buyer when doing so. I definitely would not like an uninvited house guest. I have been told threw out time that one person or another had had an item that their family member was very attached to. It was handed down to members of that family, but it also apparently brought grandpa with it. Is it possible that our loved ones loved their items so much they are not willing to leave them? If you have ever been cruising the internet and came across something that looks a little like this, it is called a word cloud. They are the hot new trend. They look cool, people become curious and they do have a bigger purpose. 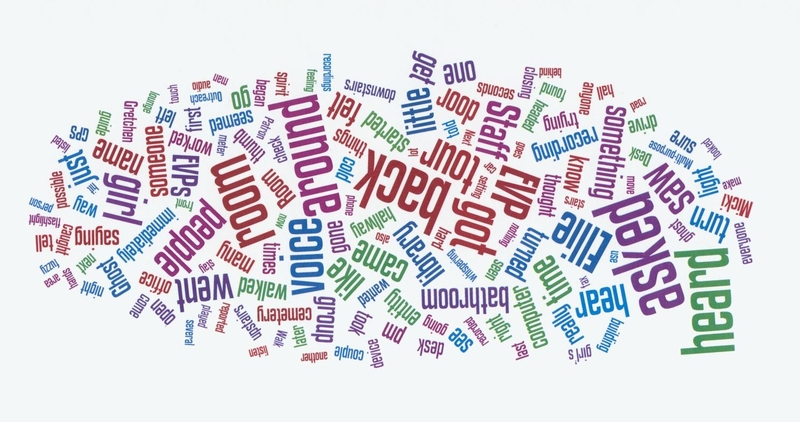 If you look close you will see that the “word cloud” actually take the words from the website and places them in a way that shows what is shown most to least. Take a look and see all the words that I have used while writing my blog. 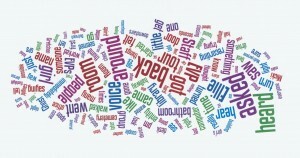 If you are interesting in doing your own check out Wordle.net. There are times patrons report hearing noises and there are times staff report they have seem something down the stacks. There are times when a voice is heard that is not really there. So you may ask “Where are the Ghosts?” The answer I always give when asked is, “Ghosts do not appear on queue.” As much as we would like a spirit to appear right when we want them to, it just doesn’t work that way. Patrons ask me all the time if there is one special place in the library that they can sit at where things will happen. That may work at some haunted locations, but not here. I do not claim to be an expert in the paranormal but I do have some experience with spirits. So for what it is worth my take on all of this is simple….I think that from time to time the conditions are right (weather, time of year, etc.) our world and their world “bump” into each other. So often we go for long spans of time without anything and then we will receive several reports all at once, so who knows. Just like all other ghost hunters, paranormal groups, etc., we just do not have all the answers. As for the staff here at the library we just gather information and record it in the Ghost Log to share with the public. If you ask staff if the library is haunted you will get several different answers, yes, no, or maybe. Some of the regular staff has had occurrences and others that have worked here for many years have had nothing. One of the ladies that I work with often has said she thinks it is actually some of us on staff that are actually causing the occurrences’. I suppose it is possible, but there were reports long before any of us in question join the SWCLS staff. A few staff members have stated that during their lives there have been many spirits appear to them at different times of their lives. We refer to them as “sensitive’s”. So I guess you could say there may be many reasons for the happenings. Many of the events actually happen when a few of us are around more than not. Tune in next time for more info on this question.